Mubarak Speech May Add Fuel To Protesters' Fire Egyptian President Hosni Mubarak addressed his country and the world Thursday night in a speech in which he was widely expected to cede power. But instead, he may only have strengthened a protest movement now in its third week. 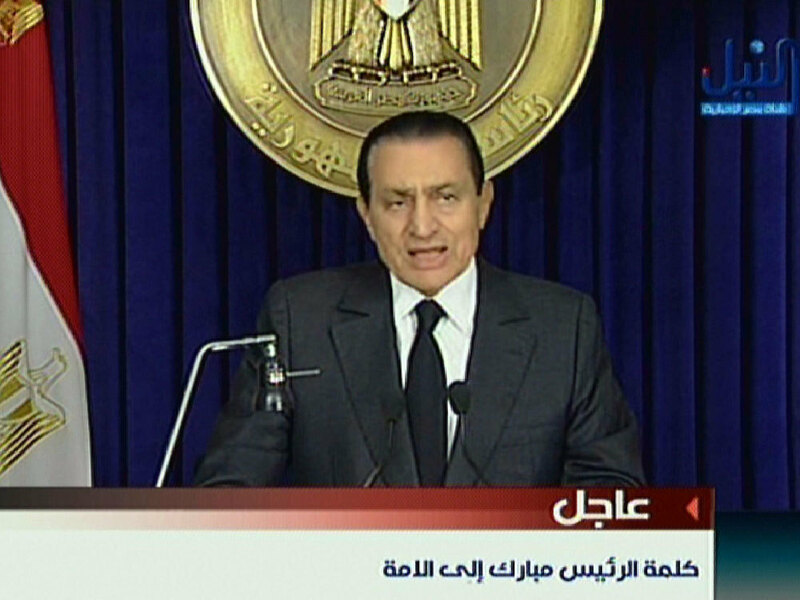 Egyptian President Hosni Mubarak addresses the nation on state television Thursday. "Defiant." "Stubborn." "Patronizing and spineless." Those are some reactions to Egyptian President Hosni Mubarak's address to the nation Thursday night, a speech in which he was widely expected to cede power — but instead may only have strengthened a protest movement now in its third week. "This was a chance to fragment the demonstrations by offering real change," says Jason Brownlee of the University of Texas, Austin. "Instead, by making no significant concessions, it's just going to enrage people." This is stonewalling. It's like waving red meat at the crowd. Mubarak announced he was transferring some powers to his recently appointed vice president, Omar Suleiman. But he didn't specify which powers, and the statement was made as an aside in a speech in which Mubarak mostly drove home his determination to stay in power until elections, slated for September. "This is stonewalling," says Nathan Brown of George Washington University. "It's like waving red meat at the crowd." Nader Hashemi, of the University of Denver, calls the delegation of some powers a "cosmetic gesture." "It suggests Mubarak is very confident," Hashemi says, "and has the military behind him, as well as other foreign support." Mubarak insisted he was laying out a "vision to exit the current crisis," but he made no commitment to end the 30-year-old state of emergency, as protesters have demanded. And his main declaration was a repeat of an earlier pledge to amend the constitution to allow for freer elections. In fact, a constitutional committee has been set up in recent days to take on this task, but analyst Brown says it is mostly composed of Mubarak loyalists and is "not credible." Egypt's constitution is key to any transition, and may be its biggest obstacle. While Mubarak repeatedly vowed to uphold the constitution, it is a profoundly undemocratic document, specifically engineered — by Mubarak — to prevent the transfer of power. The rules on who can run for the presidency are so stringent that virtually no one now being talked about as a contender would qualify. What's more, there is a paralyzing Catch-22. A new constitution is needed to elect a new leader and more democratic Parliament, yet the current Parilament — filled with adherents to the regime — would have to approve a new constitution. "It's booby-trapped," analyst Brown says. The role of the military also is crucial to what happens next. Individual members have openly sided with demonstrators, and a growing number of protesters have called for the military to intervene, even take over. After Mubarak's speech, Mohamed ElBaradei, a former U.N. official and leading opposition figure, sent out this tweet: "Egypt will explode. Army must save the country now.'" But Brownlee says it's not at all clear where the military's ultimate loyalty lies. He notes there have been allegations that the military police have detained and abused demonstrators. What's more, the upper ranks have all been appointed under Mubarak's regime, and a series of long-standing sweetheart deals gives high-ranking officers an economic stake in a number of private enterprises. All this may make the military willing to carry out a crackdown should Mubarak order one. On the other hand, it's possible there is a serious power struggle under way, with some members of the military urging Mubarak to step aside. There were contradictory messages coming from the regime all day Thursday, and U.S. officials had strongly hinted they expected Mubarak to step down. In fact, Wael Ghonim, the Google employee who has helped lead what he calls the Internet Revolution 2.0, was so sure Mubarak would go that hours before the speech he tweeted, "mission accomplished." Instead, protesters may have a renewed sense of mission; even before Mubarak's speech they had called for another mass demonstration Friday. Nader Hashemi imagines they will now seek to "up the ante, by expanding or taking their protest outside of Tahrir Square." Some have proposed marching on the Presidential Palace, something Hashemi worries could provoke the military and lead to bloodshed. Mubarak's intransigence "raises the stakes in many ways," he says. Follow a Twitter list of people NPR is monitoring in Egypt, including protesters and reporters.